VPN is one thing that most of us need for various usages because a lot of videos, content, etc. are restricted in some locations which means people of that particular location won’t be able to access those contents. In that case, VPN is the solution as it allows to unblock the blocked content and access them. Even at schools, colleges, and at your office multiple sites are blocked. So, you cannot access them. But, you can unblock those websites using VPN without doing anything technical. You just need to connect to the internet through the VPN. When we talk about VPN, NordVPN is the best in business because of its no log policy and good browsing speed. It allows you to mask your actual IP, and expose a fake IP which ultimately makes you anonymous on the web. This prevents your ISP, government, and others to keep an eye over your activities. Proxy servers also offer almost the same as VPN, but there are some notable differences between a VPN and a proxy server that you must know. You can check out those differences here. However, in this blog post, we are here to discuss all about NordVPN. To protect yourself online, getting a VPN is utmost important, and what’s better than NordVPN. The best thing is, if you buy NordVPN on Black Friday or Cyber Monday, you can get 75% OFF on 3-years plan. Yes, it is $2.99/mo. So, stop thinking, and get NordVPN Today. Looking at these pricing plans, 2 years plan is the best if you have regular need of VPN. Though VPN connections are slow because of multiple encryptions, NordVPN amazed me with its browsing speed. No doubt the speed goes slow when using NordVPN or any other VPNs because traffic gets encrypted, but the difference is almost not noticeable while you are actually browsing. Since there are nasty hackers out there who can keep an eye on our activities, and plan something shady, we need to secure ourselves using NordVPN which offers military-grade encryption. 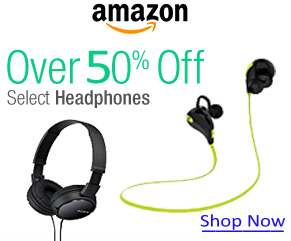 It shields you from nasty online threats and obtrusive advertisements. It also offers double VPN feature which is hiding your online activities behind several VPN tunnels. This offers double security as when you connect to a VPN server, it connects to another server and directs all traffic to it, and then it finally reaches to the final destination. In short, your traffic goes through two VPN servers. NordVPN doesn’t keep any log of your usages. Thus, it doesn’t know anything about you except your email address. That is why it has a great record as far as user privacy is concerned. It doesn’t leak your IP as well and that I have cross-checked by running a DNS Leak test. It protects your real IP by exposing a random IP address on the internet. So, that no one can track you. One of the best features of NordVPN is its automatic kill switch which saves you even if VPN connection drops for some time. 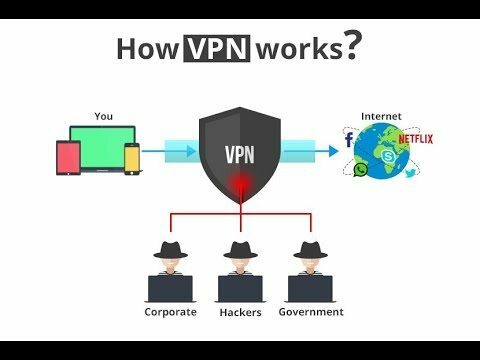 Normally, if VPN connection drops, your computer will be using a direct connection, and your real IP will be exposed, but the automatic kill switch blocks the internet connection when there is VPN connection drop happens. 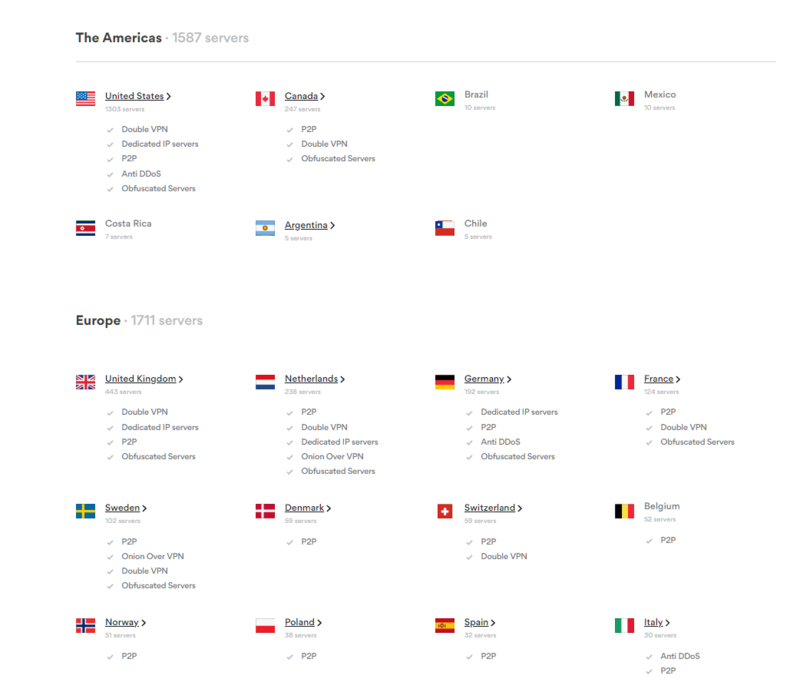 NordVPN has 3605 servers in 62 countries at the time of writing this post. These servers are divided into groups such as servers for TOR, servers for double VPN, servers for Netflix, servers for P2P, etc. It makes things easy for users as you sign up, you can choose the server group that is especially good for the particular service you want. For example, if you are getting the VPN for watching movies on Netflix, you can choose Netflix VPN servers. Many VPN companies only focus on the Desktop, but NordVPN offers its Android and iOS apps as well that you can use on your mobile phone to protect your browsing and IP address while you are accessing the internet using your phone. You can access region-locked content. You can watch Netflix videos even if it is not available in your country. You can access the websites that have blocked your IP as NordVPN offers you a different IP to connect to the internet. NordVPN has great and responsive customer support that makes things easier for you if you get some issues while setting up or using it. It also saves your from DNS Hijacking as it hides your DNS requests while you browse the internet using it. If you travel a lot and visit the countries where many big sites are blocked, NordVPN can be the best companion as it gives you the access to all those blocked websites and content. Though it is recommended not to try accessing the dark web but even if you do, you must use NordVPN as it secures your connection, and also keeps no logs at all. NordVPN has only one plan but you can get it for different periods such as 1 Month Plan will cost you $11.95 per month, 2 years plan will cost you $3.29 Per month, and 1-year plan will cost you $5.75 per month. Since VPN is the need nowadays because of too much of internet censorship, and also to protect our online identity, why not use a service that offers the best service. And, NordVPN is the one that offers the best services at the best prices with awesome customer support. Above all, its UI is so simple that you don’t feel like using it for the first time. You can easily use it effectively even if you are new to it. Moreover, if you are looking for a low budget VPN, NordVPN is not for you. But, if you are more concerned about security and privacy, this is the best bet. They charge more but the services are worth of the cost.